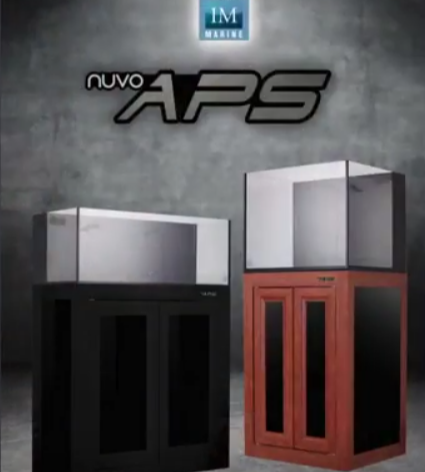 Aquarium stands can be bulky and heaving things, but the new Innovative Marine APS stands are strong, lightweight and easy to assemble aluminum framed stands aiming to be a better alternative than bulky wooden or cheaper particle board designs. The simplicity of the new Innovative Marine APS stands mean they can be assembled in under 15 minutes. The strength and lightness comes from being made from aluminum, but these don’t skip out on style either. The first run of stands feature an anodized wood grain pattern that looks pretty real. They are also planning on releasing a matte black version later this year. The stands come in eight sized to fit most of their aquariums from the Peninsula 14 stand all the way up to the largest SR-80 stand. The three small tank stands are open sided and the rest come with black side panels and doors with magnetic latches.